Goathland village sits 500 feet above sea level and has a history extending back to Viking times. In 1109 King Henry I granted land to Osmund the priest and brethren of the hermitage of Goathland (called Godelandia) for the soul of his mother Queen Matilda, who had died in 1083. This is recorded in a charter held at Whitby Abbey. The village was a spa town during the 19th century. It is still a very green area, with many stone footpaths. There are many hotels and guest houses in the village, the largest being the Mallyan Spout Hotel, named after the nearby beautiful waterfall in the valley. There is also a caravan site, reached by driving along the track which is the site of the older railway route, 1835 to 1860. Much of the surrounding land is owned by the Duchy of Lancaster. The Duchy's black faced sheep have a common right to graze on the village green and surrounding moorland that extends back for hundreds of years. As a result they are used to the many visitors to Goathland and will sometimes beg for food. Some other regular settings in the series are located outside of the village. The police house can be found about 70 miles away in the small village of Askwith near Ilkley and the police station can be found in the town of Otley. This was a real police station in past years. It was announced in New Year 2009 that filming of Heartbeat episodes would cease, with no date given for starting again. A petition of protest is being compiled by the owners of the local Post Office. Goathland railway station is on the North Yorkshire Moors Railway. It is a private charitable trust with a number of paid staff but mostly operated by volunteers, running nearly all the year including at Christmas. It carries upwards of 250,000 passengers a year and is the second-longest preserved line in Britain. It links Grosmont in the north with Pickering in the south. It follows the route of the 19th century line that originally connected to Whitby. From spring 2007 some trains on the railway are timetabled to run all the way to Whitby. Goathland railway station has also been used as the location for Hogsmeade railway station in the Harry Potter films, and the line was filmed for Harry's journey. Aidensfield Garage The village of Goathland was the famous setting of the fictional village named Aidensfield in the Heartbeat television series set in the 1960s. 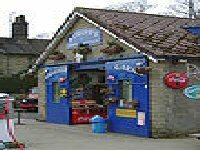 Fans of Heartbeat will not be disappointed by a visit to fictional Aidensfield village, as many of the series landmarks are recognisable, including the stores, garage/funeral directors, the public house and the railway station. 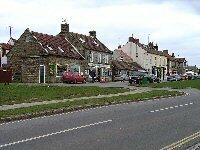 In reality the pub is called the Goathland Hotel, but in the series is the Aidensfield Arms. After filming for several years in the real pub, a precise replica, complete to the Morris dancers' "swords" on the wall, was built in the television studio. It has often been possible to see the stars of the show filming for the series throughout the Year here in the village and Whitby itself. St Mary`s the Parish Church of Goathland St. Mary�s Church, Goathland is one of five churches in the United Benefice of Middle Esk Moor. 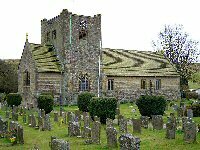 The other churches in the Benefice are at Egton, Grosmont Glaisdale and Lealholm. Combined services are held with the other churches at the monthly Benefice Holy Communion and other special services.